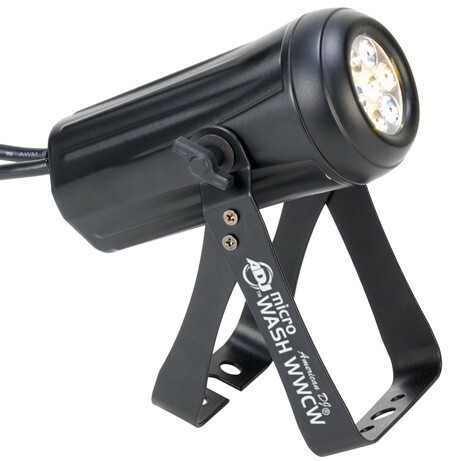 American DJ Micro Wash WWCW White LED Wash Fixture DJParts - All Variety of Parts that DJ Needs. Great for performance stages where traditional par cans emit a lot of heat onto performers 2 DMX Channel modes: 3 or 5 channel modes 5 Operational modes: DMX-512 Mode; Sound Control Mode; Macro Mode; Auto Mode; and Manual Color Mode Smooth Warm to Cool White color mixing (fast or slow color change operation) Flicker-free operation for film and television 19 built-in White Color Macros Strobe effect Electronic Dimming: 0 - 100% Beam angle: 10-degree Linkable via 3-pin XLR cables (In/Out) 3-button LED display on rear panel Dual bracket system allows fixture to be hung or set on the ground Power Draw: 15W max Run all night – No duty cycle Long Life LEDs (10,000 hrs.) LED Color Temperature: Warm White = 3000°K; Cool White = 6000°K Multi-voltage: 100-240V, 50/60Hz Dimensions (LxWxH): 6.9” x 4” x 2.6”/ 175x101x66mm Weight: 1.6 lbs. /0.74 kgs.